Earthquakes are one of the world's biggest enigmas -- impossible to predict and able to wreak untold damage within seconds. Now, a new tool from Tel Aviv University may be able to learn from earthquakes of the ancient past to better predict earthquakes of the future. 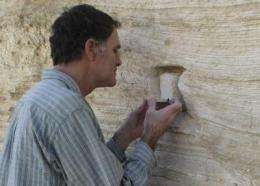 Prof. Shmuel Marco of Tel Aviv University's Department of Geophysics and Planetary Sciences in the Raymond and Beverly Sackler Faculty of Exact Sciences and his colleagues have invented a new tool which he describes as a "fossil seismograph," to help geophysicists and other researchers understand patterns of seismic activity in the past. Inspired by a strange "wave" phenomenon he studied in disturbed sediment in the Dead Sea region, Prof. Marco says the new tool, developed with input from geologists and physicists, is relevant to areas where earthquakes affect bodies of water, like the West Coast of the United States. It also can help engineers understand what's at risk when they plan new hydroelectric power plants. The new research was published in the journal Geology. "Current seismographical data on earthquakes only reaches back a century or so," says Prof. Marco. "Our new approach investigates wave patterns of heavy sediment that penetrates into the light sediments that lie directly on top of them. This helps us to understand the intensity of earthquakes in bygone eras  it's a yardstick for measuring the impact factor of earthquakes from the past." The researchers propose that the physics governing the sediment patterns is similar to a phenomenon found in clouds and sea waves but in the case of rocks it was the earthquake shaking (rather than wind) that triggered the formation of waves. The scientists call it the "Kelvin-Helmholtz Instability," which describes a theory of turbulence in fluids. The Tel Aviv University team applied this theory to analyze the deformation of sediment caused by past earthquakes. Prof. Marco and his colleagues found that the deformation begins as moderate wave-like folds, evolves into complex recumbent folds, and finally exhibit instability and fragmentation. The deformation process advances depending on the earthquake size  the stronger the earthquake, the more intense the deformation. The seismological record for fault lines like those near Jerusalem and Los Angeles simply isn't old enough to predict when the next quake might strike. "We've expanded the window of observation beyond 100 years, to create, if you will, a 'fossil seismograph,'" says Prof. Marco. He adds that the tool is only relevant in earthquake zones that intersect with bodies of water such as lakes or the sea. But it could be very relevant to geologists studying earthquake patterns in areas like the Salton Sea in Colorado. The Salton Sea, only 100 years old, is located directly on the San Andreas Fault in California's Border Region.